Burton Albion's latest signing Ivan Calero says the chance to play for one of his footballing heroes, Jimmy Floyd Hasselbaink, was crucial to his loan move from Derby County. The Spanish midfielder, 19, was an Atletico Madrid fan and used to watch the Brewers boss during the striker's one season with the club. "He was top scorer and it was great to see him," Calero told BBC Radio Derby. "He was a big hero in because of his goals. He's one of the reasons I came." 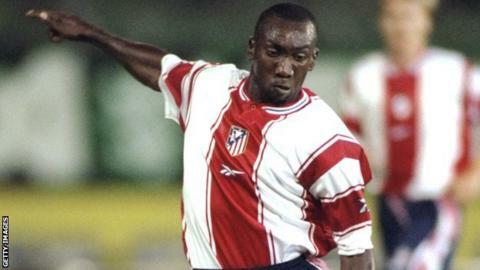 Former striker Hasselbaink scored 24 league goals in 34 games for Atletico, and a total of 32 in all competitions in the 1999/2000 season. But despite his efforts the club were relegated. and the Dutchman joined Chelsea. Calero, who agreed an initial one-month loan on transfer deadline day, added: "He is a great influence because he was a really nice player, one of the of the best I have seen. "I can learn many things from him. It's a great opportunity for my development and to get some experience." Calero, an attacking player who can play anywhere across the midfield, has made three substitute appearances for the Rams this season, and scored the winning goal in League Cup victory over Charlton Athletic in August. The teenager has been a regular for Derby's Under-21 side, but has been unable to force his way into a team who are second in the Championship. Calero said he was eager to get regular game time at first-team level with League Two side Burton, who are also second in the table. "The team are in a great position and hopefully will be promoted and I came here to help," he added. "I am not frustrated. This is football. I am working hard. I think I am doing well in the Under-21s. The opportunity did not come many times at Derby so I have to keep working and the opportunity will come. "I think I am already a different player and am adapting to English football and England, and that is important." How does your salary compare with the world's top players? Read more on How does your salary compare with the world's top players?